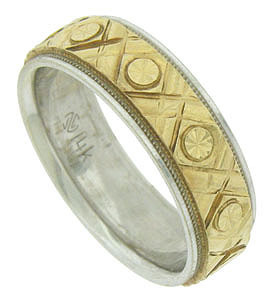 This handsome estate wedding band is fashioned of white gold and features a center yellow gold band adorned with deeply engraved cross hatching and abstract daisies. Impressed milgrain frames the center design. 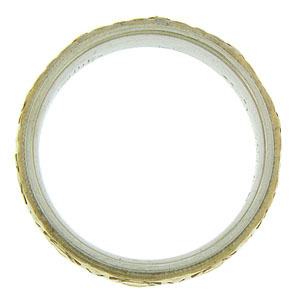 The wedding ring measures 5.94 mm in width. Size 6 1/4. We cannot re-size.